Posted on Fri, Feb 3, 2012 : 7:16 a.m.
An image from "Video 50"
Just as avant-garde stage director and playwright Robert Wilson’s “Einstein on the Beach”—recently presented in Ann Arbor—is intended to redefine epic theater, “Video 50” at the University of Michigan Museum of Art’s New Media Gallery is intended to redefine the art of cinema. But where “Einstein on the Beach” represents Wilson at his most ambitious, crafting theater on a majestic scale, “Video 50” is intent on minimalizing cinema to its bare roots. In much the same way that Brian Eno’s seminal 1974 “Discreet Music” took the Muzak out of music by creating a new standard for aural minimalism, Wilson’s 1978 “Video 50” strips filmmaking to its elemental components. As the guest curator Ruth Keffer tells us in her gallery statement, “Created in a studio at the Centre Pompidou in Paris, ‘Video 50’ was the product of an experimental television workshop in Germany, ‘Das kleine Fernsehspiel,’ a program of the state-sponsored ZDF channel that continues today to promote emerging film and video artists. Wilson intended the episodes, broadcast in any quantity and in any order, to serve as late-night or between-program filler, and they functioned that way in Germany and France. It turns out Wilson was well over a quarter-century ahead of his time, as segments of his art video is now available on YouTube. However, this dismembering also only hints of “Video 50’s” experimental intent. For ironically, his minimal intent has a touch of grandness embedded within. As Keffer further says, “Video 50” is precise in its “intentionally imprecise manner,” being “a randomly arranged set of 30-second ‘episodes’; counting occasional repeats and alternate versions (with) the 50 pieces of the title numbering nearly 100. “Some of these episodes are static to the point of resembling still-lifes; others are self-contained vignettes that begin and end—or seem to end; any narrative resolution teasingly withheld. 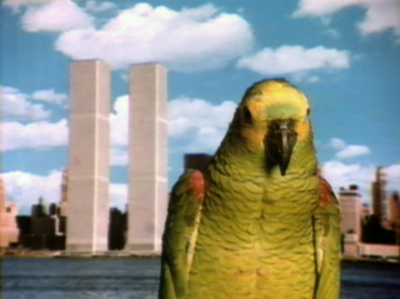 A frame from "Video 50." Which is to say there’s absolutely nothing amateur about “Video 50”—or its paradoxical surreal logic. This is a professionally mounted film production whose special effects, crafting, editing, and acting is as polished as any other. “Video 50” is a quite challenging interpretation of the “Kuleshov Effect” pioneered by 1920s Soviet-era Russian filmmaker Lev Kuleshov. where the editing and repetition of montage elements creates a psychological gestalt that conditions our response to the visual narrative. In one instance, a clip of a woman intently looking down followed by a clip of a smiling child in a basket creates the inference of maternal affection, while the juxtaposition of the same woman with a bowl on a table indicates hunger. The premise is that we bring our association to these elements as they’re presented to us, which makes cinema the ultimate form of participatory art. Yet rather than slavishly lock himself in a repetitive format, Wilson (as Keffer points out) subtly shuffles his video diary in such a way that some episodes—for example, a dangling chair twisting slowly in midair in front of an orange-tinged cloud cover—serve as transition devices, allowing us to view the next 30-second episode afresh; while other episodes advance their narrative by seemingly insignificant developments. In one vignette, then French Culture Minister Michel Guy struggles to open a dresser drawer in the company of a maid, while in another episode perfumer Helene Rochas winks at the viewer after staring down a mugger. In yet another interlocking series of vignettes, window shades billow wildly from an essentially disembodied window frame in a darkened room; while later, Minister Guy’s maid in the drawer episode closes the window, only to have the wind continue to blow through the shades erratically; then in another episode, a young man seen in yet another series of unrelated episodes sleeps fitfully front of the window during a blustery rainstorm. And so it goes: A young girl swings happily in and out of the film’s frame on a hidden tree branch in a luxuriant forest; a young couple repetitively eat a stack of hot dogs at a table; a duck chortles manically into a microphone; a young man reaches up to turn on a light bulb hanging diagonally from the ceiling above him; and a woman pensively studies a smoking toaster at eye-level—among many other episodes. The range, imagination, and complexity of Wilson’s vignettes mingle seemingly indefinitely. But it is the audience that provides the narrative logic (or lack thereof). Using VHS analog recording now converted to digital, “Video 50” has been made in the service of anti-commercial cinema. It was a refreshing anarchistic change of pace then, and it’s a refreshing anachronistic change of pace now. “Robert Wilson: Video 50” will continue through April 29 at the University of Michigan Museum of Art, 525 S. State St. Museum hours are 10 a.m.-5 p.m. Tuesday-Saturday, and noon-5 p.m. Sunday. For information, call 734-763-UMMA.